Shiloh is a beautiful blue merle Aussie. He went missing in Indiana in October 2012. For seven months there were no sightings of him. 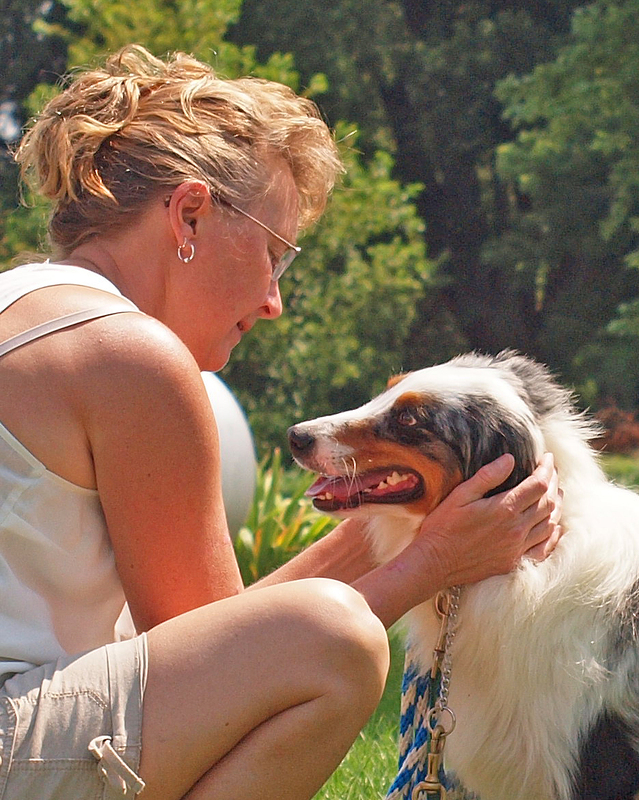 Betsy Cripe never gave up the search for her Shiloh. She continued to post flyers and reach out to social media sites. She finally received word from a woman named April Green that Shiloh was hanging around in Carmel, some 20 miles from where he went missing. Betsy did what she could to capture Shiloh but he refused to be caught. ODR happened on the Facebook post, “Bring Shiloh Home.” I reached out to Betsy and asked her to contact me if she would like a few tips from a trapper. After thinking about it for a few days, Betsy called. She agreed to go the ODR route and set up a 3 sided wire fence feeding station. When Shiloh began taking food from the feeding station, we talked about the next step ~ trapping him. We both agreed it would be best that I do the trapping. Betsy purchased airfare for me and on Friday, 09August2013, I landed in Indianapolis, Indiana. Betsy met me at the airport. I checked out the feeding station and we made a capture plan. Betsy and I arrived back at the feeding station on Saturday at 5am. I set the trap and Betsy and I waited nearby in her truck. Just before 6am, Shiloh appeared. Just after 6am, Shiloh’s 267 days on the run were over. We drove home to Betsy’s home and woke up her sleeping daughter, Heather, who couldn’t believe her eyes. On Saturday, 3August2013, I received a phone call from a lady in Ocean Shores who said a Golden Retriever has been running along the bay behind her house the past two days. No one can catch the dog. I packed up my large collapsible live trap and headed to her home. I saw the dog heading south along the bay. As the dog was said to wander back and forth along the bay, I decided to set up the trap in the marsh grass. When the dog didn’t return, I decided to drive south. I pulled off the road and onto a makeshift road and saw the dog. She saw me but didn’t run. I grabbed my leash and two packs of hot dogs and lay on the sand. I threw hot dog bits her way. It wasn’t long before I had a leash on her and she was in a crate in my minivan. 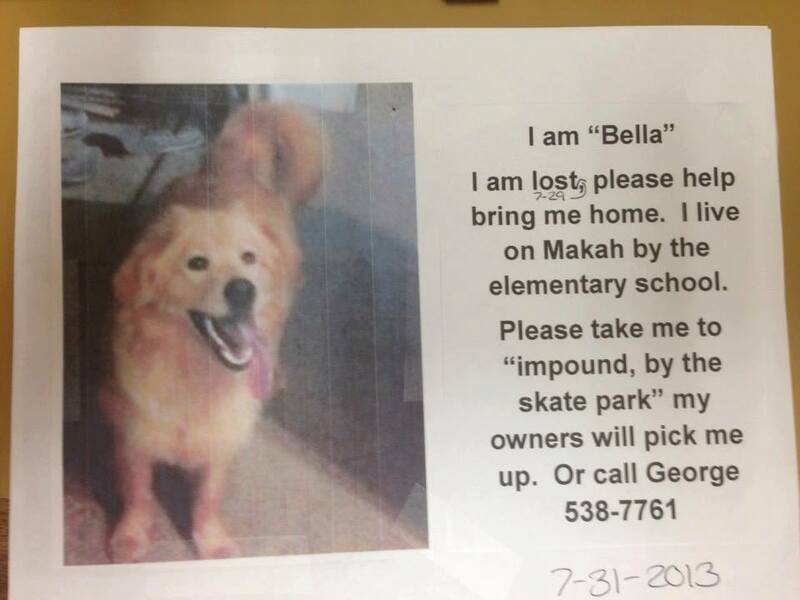 I called Harbor Dispatch and learned that a dog named Bella matching her description had gone missing on 21July. I arrived at her home just as her family was arriving back from a catering job at the convention center. George Lee and his family were very happy to have their beloved Bella home. He explained that someone had left the side gate open and Bella and their other dog slipped out. The other dog returned home a short time later. Bella evaded capture for 13 days! On Sunday, 31March2013, I received a phone call from LaReina DeLay. She said she purchased a 14 month little blue Heeler named Zoey on the previous Friday. LaReina thought she had correctly attached the leash to the collar before opening the door to take her outside for a potty break. When Zoey realized she was not leashed, she ran off. 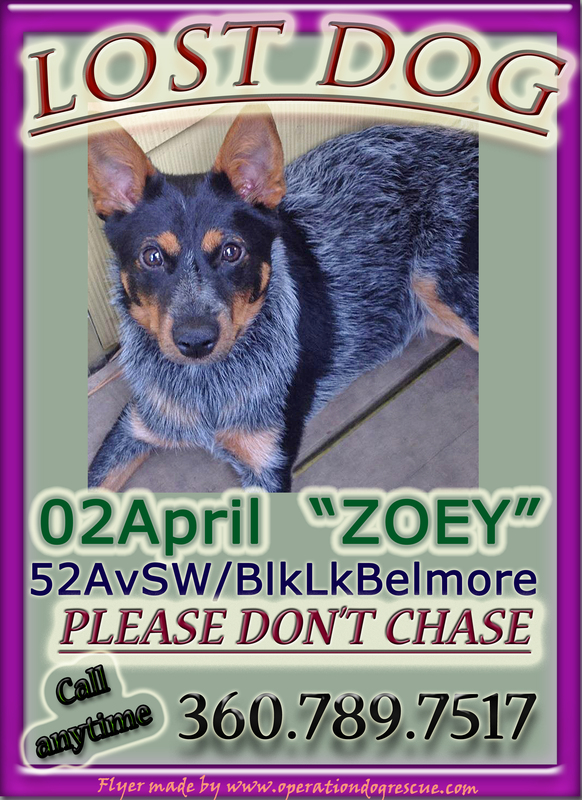 LaReina followed Zoey until she lost her in nearby woods. She made and posted flyers. I drove out that Easter Sunday, met with LaReina and devised a strategy. 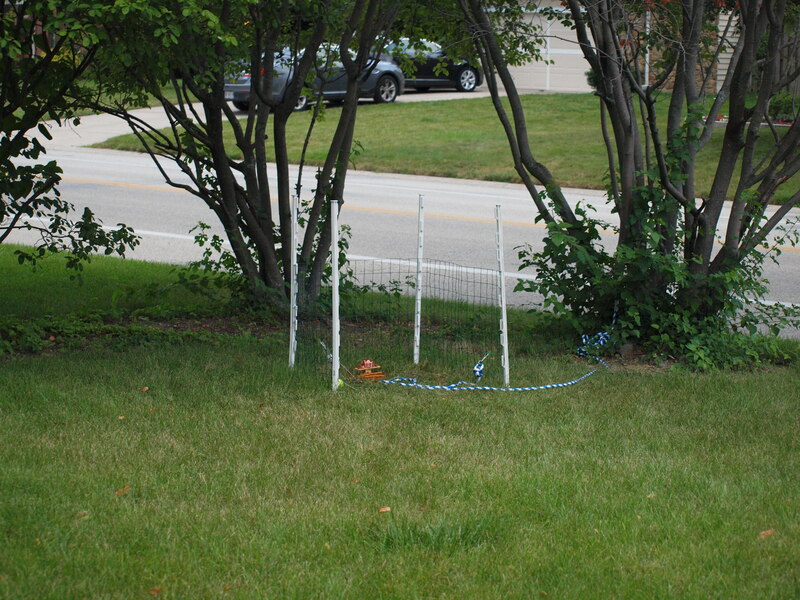 We set up several live traps in strategic areas and scouted areas where Zoey had been seen. It was decided that I would come back on the following Tuesday to post flyers, to search surrounding neighborhoods and to set and monitor traps. LaReina graciously invited me to stay in her home. While driving around, I saw Zoey two times. Both times she was being chased by two little scrappy neighbor dogs. Capturing a dog is not easy to do when it is being chased but our hopes were high that we would have her soon. Tuesday was the last day Zoey was seen. I left for home on Friday. I planned to return a few days later to post more flyers and again drive the neighborhoods. Fellow ODR capture partner, Molly Elliott, joined me in the search several times. I ordered large lawn signs and planned to post them the following Saturday. On the evening of Tuesday, 09April, exactly one week after Zoey’s last sighting, I received a text from LaReina asking if I knew what she had in her car. I replied, “A CLH?” “CLH” stands for cute little heeler. When she said, “Yes, a CLH,” I could hardly believe what I was reading. LaReina said earlier today Zoey began to follow a dog and his human who were out walking. When Zoey followed them home, the human invited her inside. It took a little convincing but Zoey finally agreed. The human checked Craigslist and found Zoey’s posting. The rest is history. 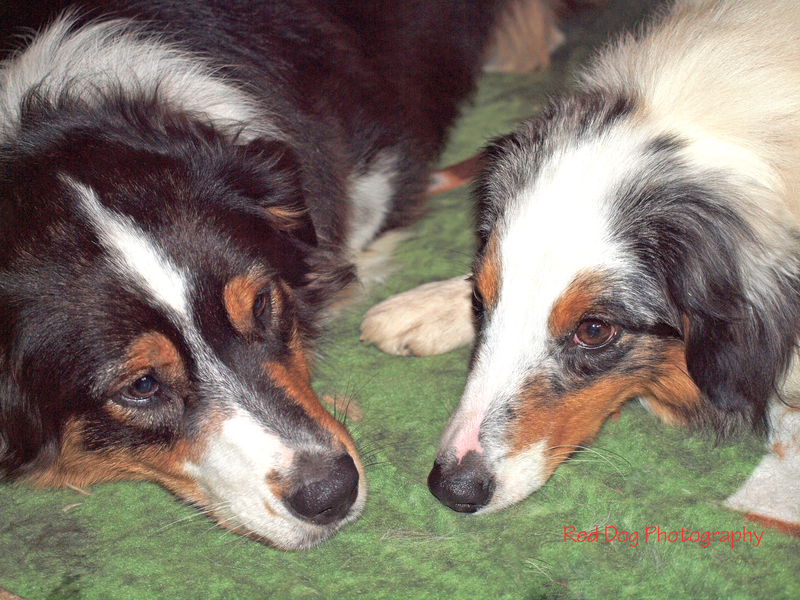 On Sunday, 13January2013, Willow arrived at her new foster home in south Aberdeen, WA. 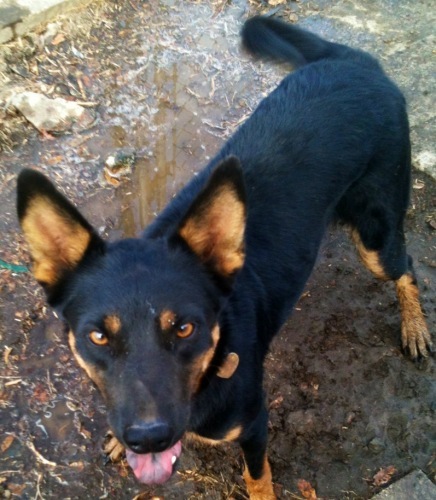 Willow is said to be a Kelpie but looks like a miniature smooth coat German Shepherd Dog. It didn’t take long for Willow to jump the short wood fence. Over the next few days, she jumped back and forth over the fence but wouldn’t be touched. On Wednesday morning, Willow’s foster mom called ODR and reached out for help. Vivian responded to the area, met with the foster mom and drove around looking for Willow, who hadn’t been seen that day. In the evening, Vivian set up a live trap and, as she headed for home, saw Willow. Vivian decided to drive back to near the foster home, to wait and to watch. It wasn’t too long before Willow arrived and began circling Vivian’s minivan. Vivian grabbed some tasty treats and sat down in the road. Willow really liked the treats. It only took her about 15 minutes to gain enough trust and come close enough that Vivian was able to grab her collar and slip a noose over her head. Vivian returned her to the foster family and spent about 20 minutes in the house with Willow while she got to know the family a little bit. This is one sweet girl who will need special care to keep her safe. It was all Vivian could do to not take her home. Strider, a young Malamute, came to Washington State in November 2012 from a puppy mill/hoarding situation in Montana. During his transfer to his new foster home, he slipped his collar and was on the run. He headed south from Shoreline, WA all the way to Ravenna Park in Seattle, WA. During the next few weeks, Strider played with local dogs and even let a few people pet him but not slip a collar over his head. After a few weeks, Strider left Ravenna Park, headed north and found a nice neighborhood. He also made new friends with Tim and Josh and their two Australian Labradoodles. Strider made himself at home, sleeping in their unfenced front yard, eating regular meals and playing with his new buddies. Over the weeks, the Malamute rescue folks posted fliers, followed his trail and tried all the typical capture methods. Strider wouldn’t have anything to do with being locked in a fenced yard [easily scaled it] or going into a live trap [too scary]. Having recently assisted [via telephone and email] another at-large Malamute [from the same puppy mill] that had gone missing in Idaho, Operation Dog Rescue was known to the Malamute Rescue folks.ODR and Washington Mal Rescue began communicating and negotiating what needed to be done prior to responding to Ravenna. A date was set for the capture. On the morning of Saturday, 08December2012, ODR packed up, left the slow pace of the beach and hit I-5’s frenetic traffic.A wonderful group of animal lovers came together with one purpose in mind ~ to safely and quickly capture Strider.ODR set the trap inside the feeding station from where Strider had grown accustomed to taking his meals. He was fashionably late for dinner so Tim, Josh and the boys went for a walkie. It wasn’t long before Strider appeared and followed them home. Strider waited for his meal to be left in the feeding station. Within five minutes, Strider had taken the bait and his some four weeks on the run were over.He was safely put into a crate and transported to his foster mom’s home. He took it all in stride. I’m sure once he is acclimated to the life of a domestic dog, he will make someone a wonderful companion. It is likely he may never be a reliable off-leash dog and ODR highly recommends he be outfitted with Tagg, The Pet Tracker, which is a GPS tracking system that can track his movements should he escape again. Jack has been rescued three times. The first time was in September 2009 when he walked in to a live trap that Vivian had set out for a missing dog. Come to find out Jack was a feral dog. He had been living on his own in Copalis Beach, Washington State for most of his young life. He scavenged garbage cans to survive. Vivian brought him to the local shelter for evaluation, unfortunately a visitor opened the door to the dog house and Jack bolted. Four days later, he was back in Copalis Beach. Luckily, he again walked in to a live trap only a few days later. 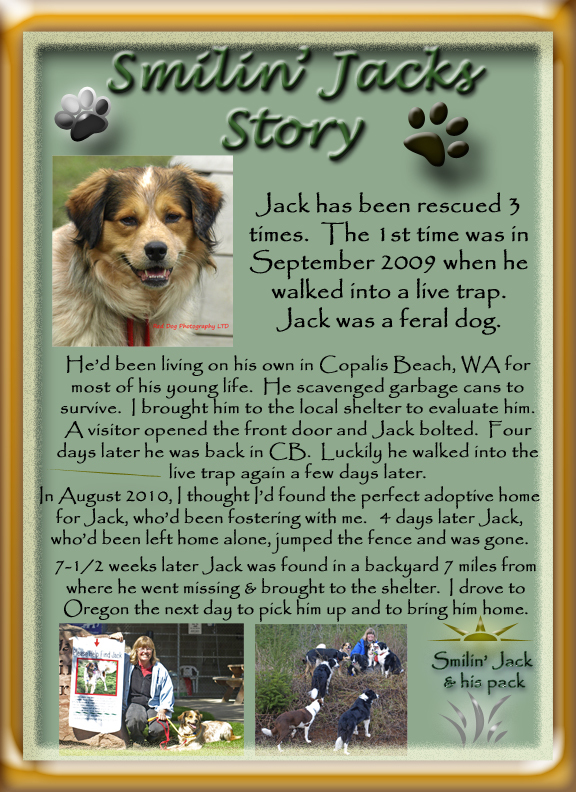 In August 2010, Jack was adopted to a family living in Oregon. Four days later, Jack jumped the fence and escaped. 7-1/2 weeks later, Jack was found in a backyard seven miles from where he went missing and was brought to the local shelter. Vivian was notified, drove to Oregon the next day and brought him home. He has been part of Vivian’s pack ever since. 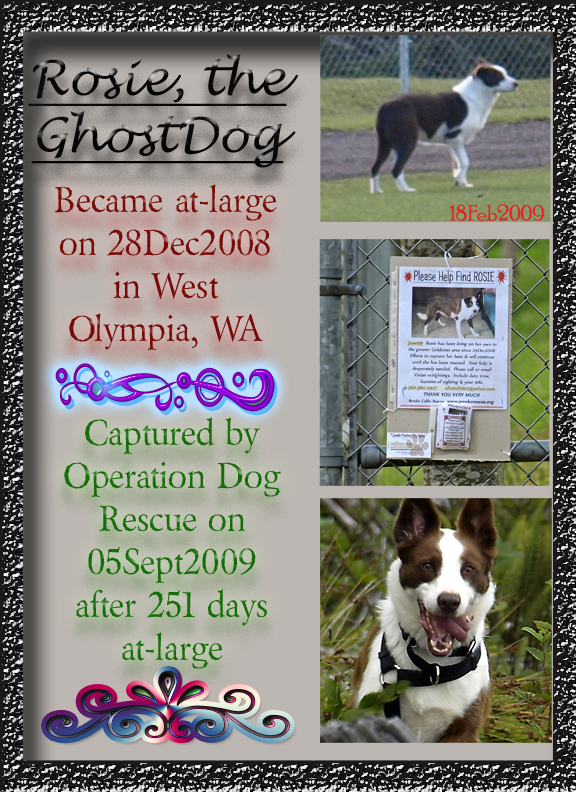 Rosie was lost on December 28, 2008 in Olympia, Washington. She was captured by Operation Dog Rescue on September 5, 2009 after 251 days at large. 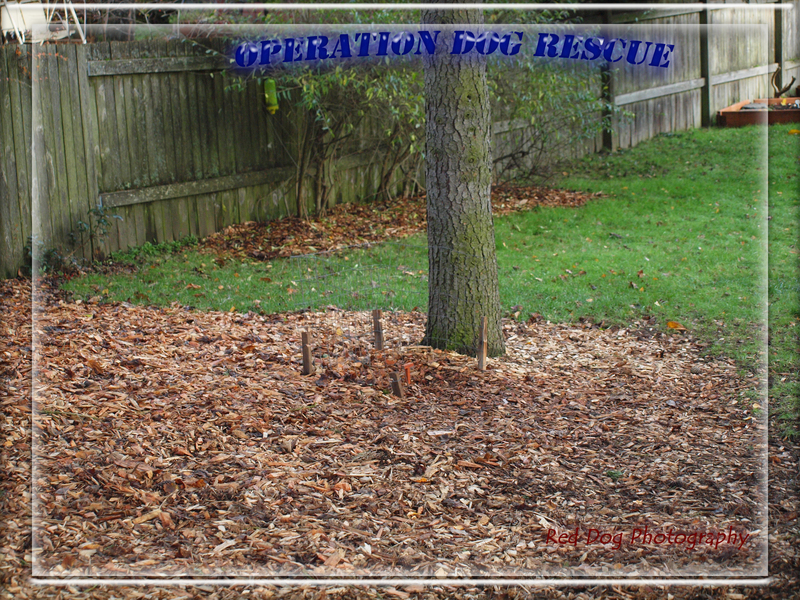 Rosie is really where it all began for Vivian and Operation Dog Rescue. She was a novice trapper and devised and implemented dozens and dozens of plans to capture Rosie, all of which failed. That was until Vivian discovered her specialty trap. Rosie has been part of Vivian’s pack since her capture. 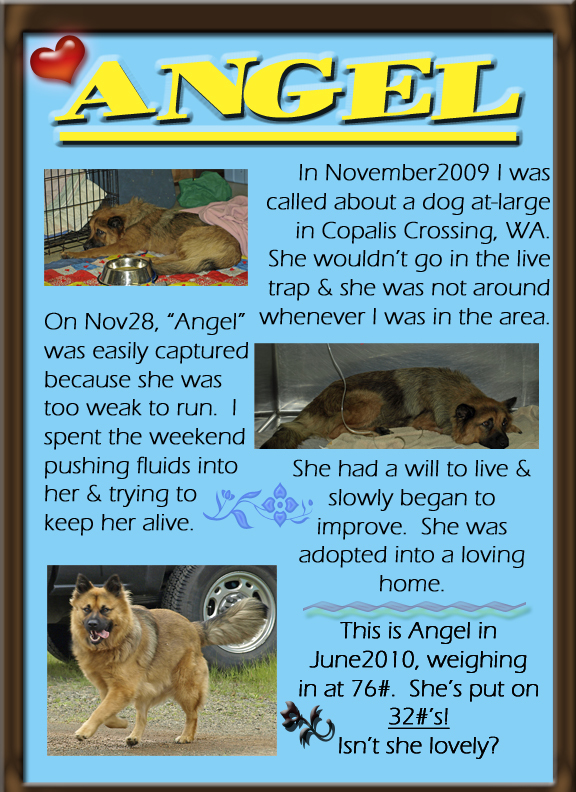 In November of 2009, ODR was called about an “at large” dog named Angel in Copalis Crossing, WA. A live trap was set for Angel, but she wouldn’t go in. Angel never showed her face when ODR went in search of her. 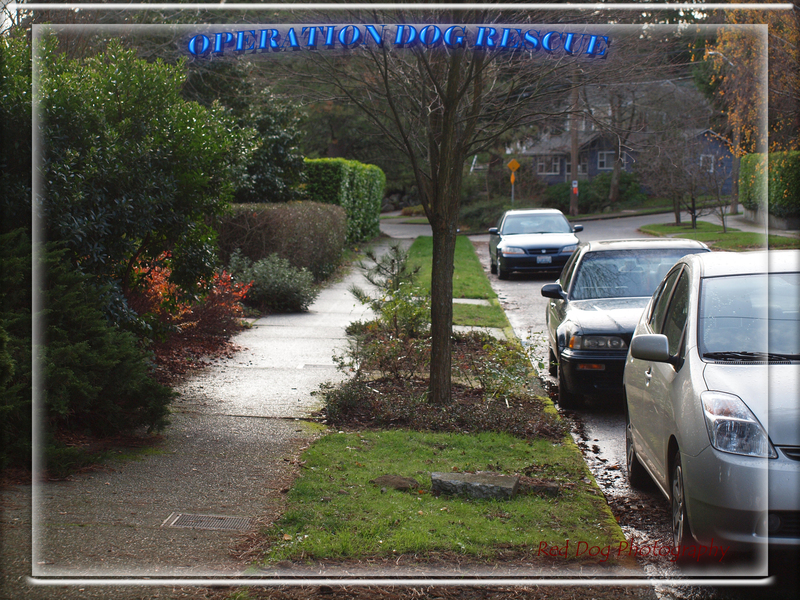 Eventually, on November 28, ODR captured Angel, who was too weak to run and near death. With the help of veterinarians and Vivian’s loving care, Angel was nursed back to health and adopted into a loving home. Since then, Angel has doubled her weight, putting on 32 pounds. She is happy and healthy and her family loves her. 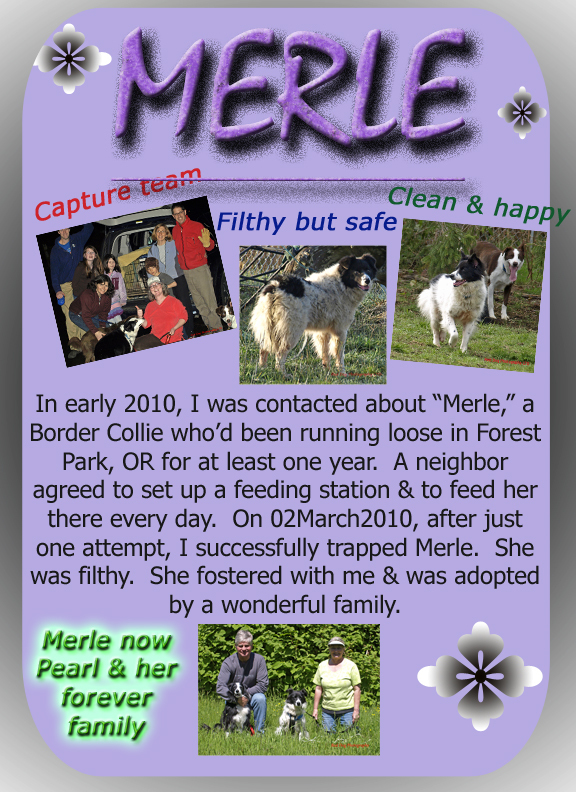 In early 2010, Operation Dog Rescue was contacted about “Merle,” a border collie who had been running loose in Forest Park, Oregon for over a year. A contact person agreed to set up an ODR “feeding station” and faithfully supplied the feeding station with fresh food every day. On March 2, 2010, after only one attempt, ODR made the trip to Oregon and successfully captured “Merle.” She was filthy! She fostered with Vivian for rehabilitation and adopted by a wonderful family who adore her. Her name has been changed to Pearl. 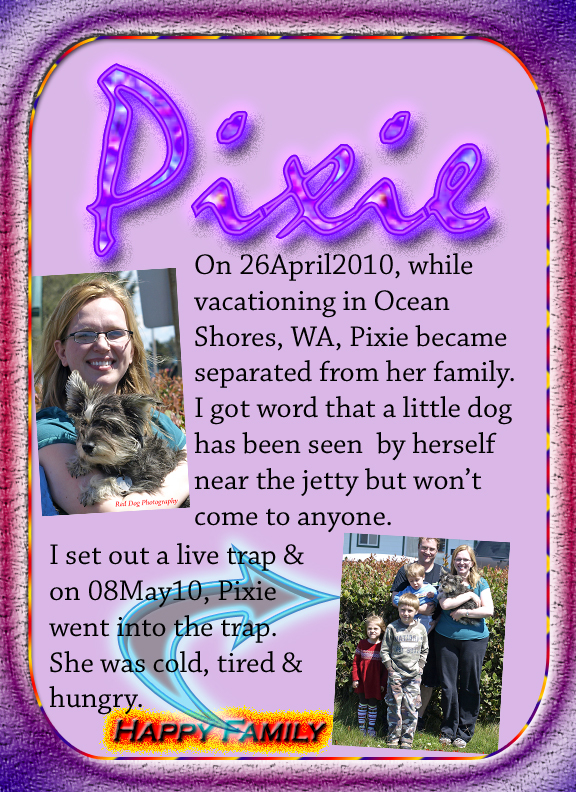 On April 26, 2010, while vacationing in Ocean Shores, Washington, Pixie became separated from her family. Her famliy had to return home. A few days later, ODR received word that a little dog had been spotted by herself near the jetty but wouldn’t come to anyone. ODR set a live trap. On May 8, the little dog, who turned out to be Pixie, was caught in the trap. She was cold, tired and hungry and so ready to be reunited with her family. We are so glad that Pixie is now home. Lilly and her family made the trek from Idaho to Pacific Beach, Washington in July 2010 for a short vacation. One day, while on the beach, Lilly began to run – and didn’t return. After several frantic days of searching, her family had to return to Idaho without their beloved Lilly. Word filtered to ODR about Lilly’s plight. It was discovered that Lilly would frequent Pacific Beach, but wouldn’t let anyone near her. ODR contacted Lilly’s family and offered to help. ODR made a “LOST DOG” flyer and posted it around town. 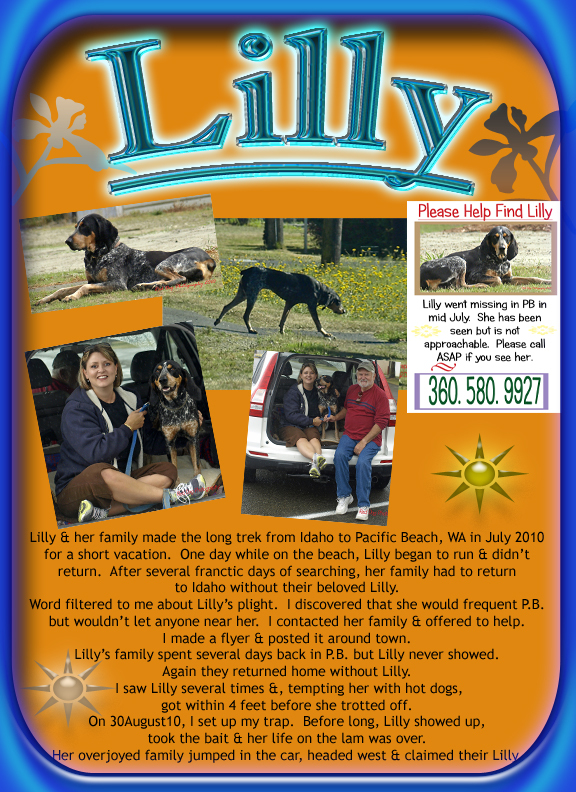 Lilly’s family spent several days back in Pacific Beach, but Lilly never showed. Again, they returned home without Lilly. ODR saw Lilly several times and was at one point able to get within four feet of her before she trotted off. On August 30, 2010, ODR set a trap. Before long, Lilly showed up, took the bait and her life on the lam was over. Her overjoyed family jumped in the car and headed west to be reunited with Lilly. Lilly howled for joy when she saw her family. 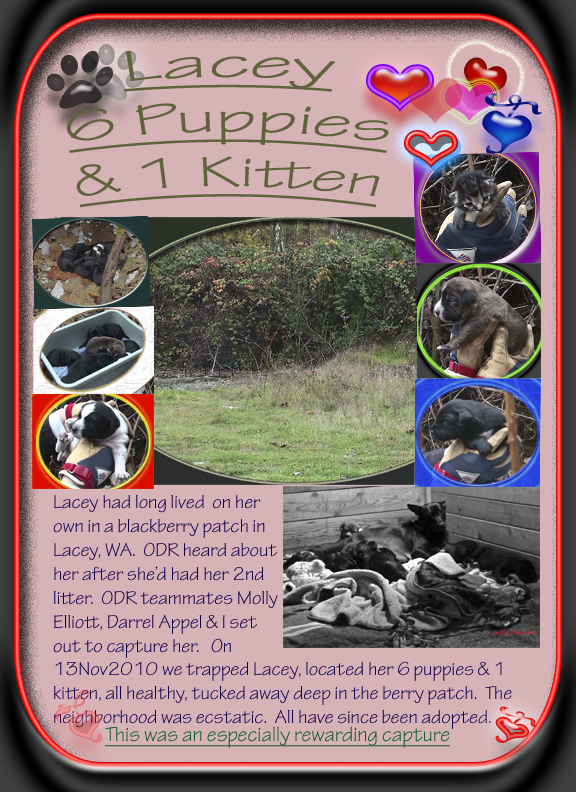 “Lacey” had long lived on her own in a blackberry patch in Lacey, Washington. Operation Dog Rescue heard about her after she’d had her second litter of puppies. ODR teammates Molly Elliott, Darrell Appel and Vivian Dahlin set out to capture her. On November 13, 2010, Lacey was successfully trapped. Lacey’s six puppies [and one kitten!] were found, healthy and safely tucked away deep in the berry patch. The neighborhood was ecstatic! All dogs and kittens have been adopted through Concern For Animals. This was an especially rewarding capture for ODR. 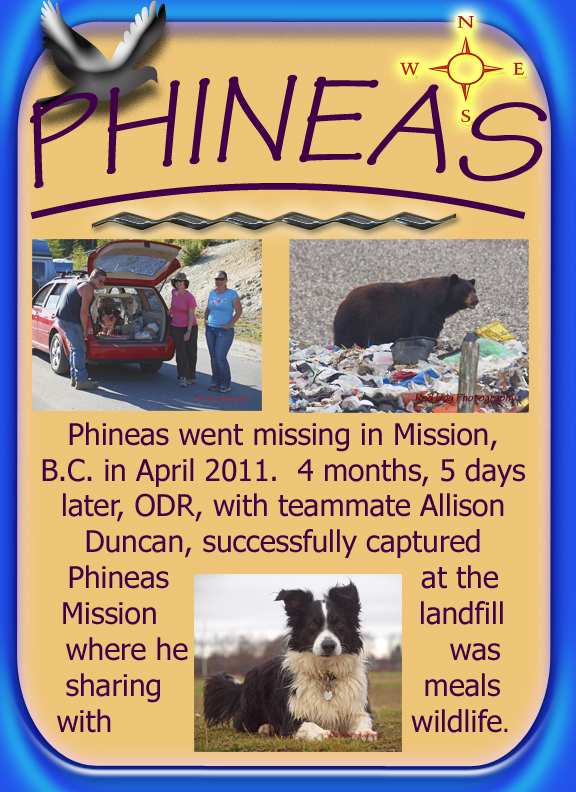 Phineas went missing in Mission, British Columbia in April 2011. Four months and five days later, ODR and Phineas’ former foster mom, Allison Duncan, successfully captured Phineas at the Mission landfill where he was sharing meals with crows and a really big bear. Phineas had traveled many miles south, east, west and finally north where he found plenty of good eats at the landfill. He is one tough little guy. He’s still fostering with Vivian and will likely be a permanent part of the pack unless or until the perfect family, who understands a dog with extreme behavioral issues, comes along. 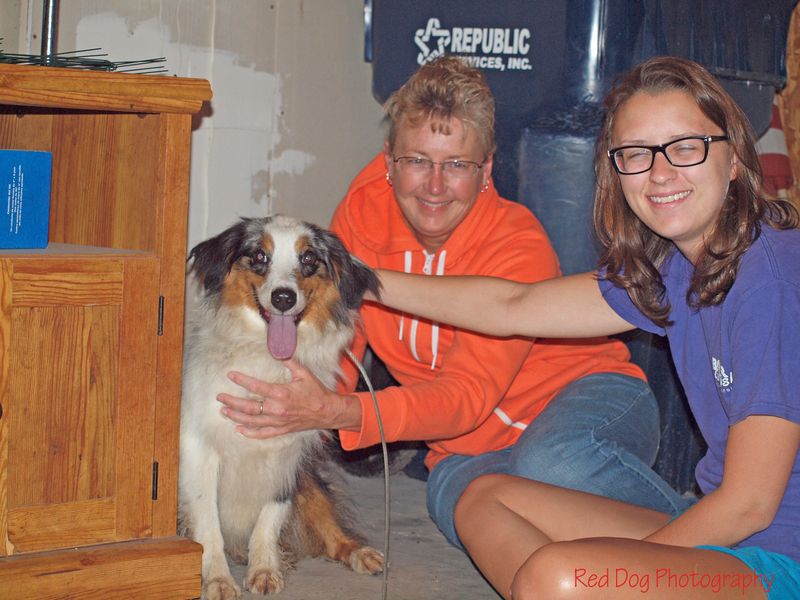 Scout is a young red merle Australian Shepherd. He was living out of state and needed a new home. 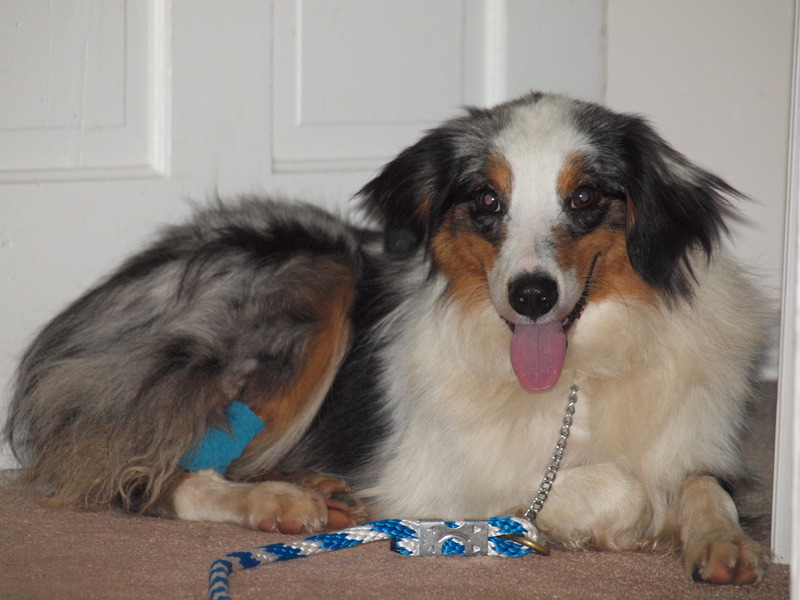 Aussie Rescue offered to find a foster home for him and on August 24, 2011, Scout was flown to the Bellingham, WA airport by PilotsNPaws where he was met by his new foster mom. Unfortunately, Scout slipped his collar and bolted. Search parties and tracking dogs were utilized but were unable to capture him. In September, ODR was invited to help. 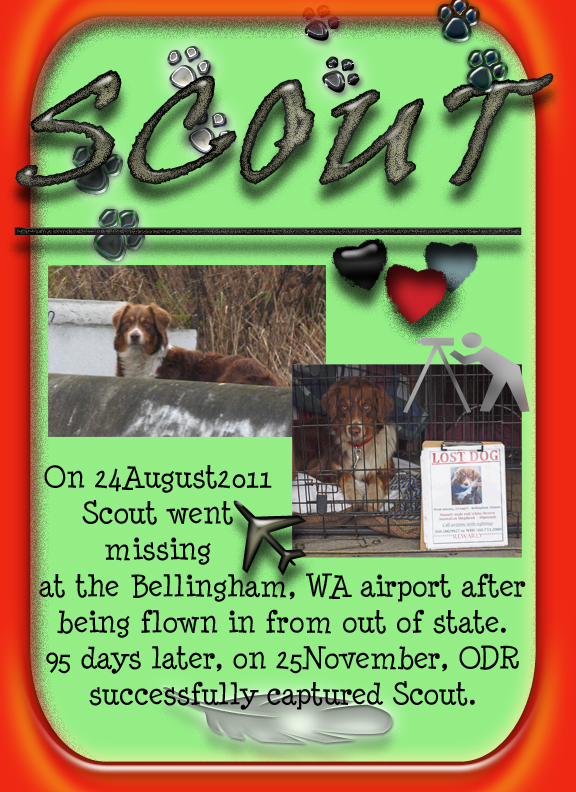 By this time, Scout had left the airport property and hadn’t been spotted in some time. Vivian packed up her little motor home and a few dogs and headed north. She spent days saturating west Bellingham with flyers and contacting locals. After four days with no reported sightings of Scout, Vivian returned home. The day after Thanksgiving, Vivian received a call from Officer Ginn, with the Lummi Nation Police Department, who said Scout had taken a liking to a female dog and was regularly seen hanging out near the dog’s home. Ofc. Ginn, who has taken on the role of animal rescue cop in addition to her regular patrol duties, had set up a live trap. Unfortunately, Scout would have nothing to do with it. Fortunately, Ofc. Ginn continued to leave food for Scout which kept him in the area. She knew that Scout didn’t belong to anyone in the neighborhood but hadn’t realized he was a “wanted” dog until she happened upon a flyer that Vivian had previously posted. Vivian set up her trap, parked down the street and waited. It wasn’t long before Scout showed up, nosed cautiously around and, within a few minutes, his 95 days on the run were over. Once safely secured in a wire crate, Scout seemed to take a deep breath, realizing that he was safe and his life would be better from now on. He licked Vivian’s hand. Scout was turned over to Aussie Rescue for rest, rehab and eventual re-homing with a family who understands the needs of the breed and understands that he will be a flight risk until he has bonded with his people and home.